I finished developing an extension that allows for pixel-perfect collision. Yes, as i mentioned in the readme it needs 2 little changes to andengine. I don't really know why it wasn't already implemented, since as you can see it is implemented in bitmap texture atlas, and the buildable texture is just a wrapper around it. The second one adds a few methods for transformations. What transformNormal (similarly to the function of C# XNA)do could be achieved by using transform of the vector and then subtracting the result of transform on a 0s vector, thus being slow and making code harder to follow. As you can see, none of this method is strictly necessary, but without the change it would make the collision check code slower or harder to read. Got it setup easily and am using this in my project! This is amazing, good work! I checked on the github repository and as you stated DrawType is now a separated class. Really strange, since i just pulled from the repository and in my local repository it is still inside VertexBufferObject.. I have your extension installed and have run your collision test project to see how it works. I then tried to get my own to work and for some reason it is not working. I'm wondering if your images were created differently from mine? Are you using any other properties or doing something different? 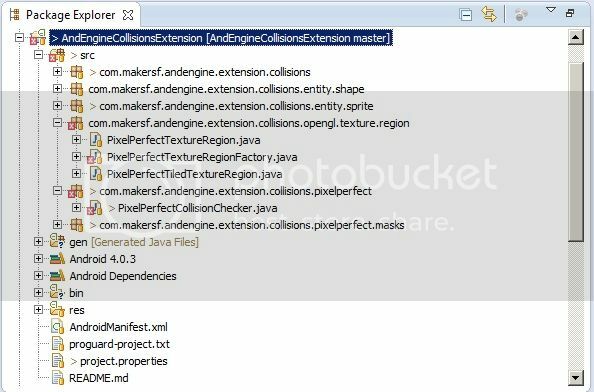 I tested your extension with the last version of andengine, and compiled with the changes made to the engine. When running the test, I see the two stars and the triangle, but does not show me the messages to collide, where should appear?, looking at the code, I do not understand where you see posts. Solved my problems with git and now the extension is updated to the last AndEngine revision. Absolutely not, they are normal png. I remember you that you need to use a format that supports alpha channel in order to use this (for example png, and not jpeg). Showing the code that create the sprite and the texture region can be helpful to understand the problem. Btw, as a reminder to everyone, i already put in the source the class MaskUtils that can be useful in this cases: use the writeMaskToSDCard(IPixelPerfectMask pMask, String pRelativePathFromSDRoot, String pFileName) method in order to check if the generated mask is correct, and then track down if the problem is in the generation or in the collision code. Btw, what do you mean with "not working"? 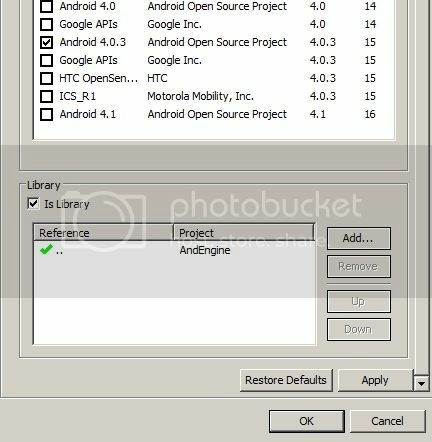 Compile error? Crash? Wrong result when calling collidesWith? I'm using a png image and it is only checking collision around the bounding box of the sprite. I created the image in gimp so it should have an alpha threshold, but maybe I'm not using a correct value? Also, I'm not using any code that obtains the bitmapmask, is that neccesary to check for collision within the bounding box of the sprite? If so, could you include an example of how to do that? I don't remember seeing any in your collision test project and that worked fine without it, so I assumed its not needed.